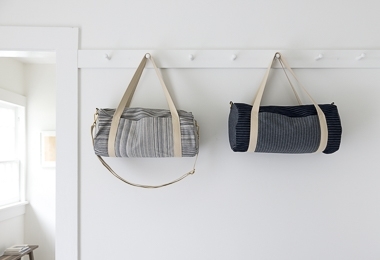 Sewing this dapper Weekender Duffle taps right into all the excitement of an impending trip. With every seam, you imagine all the places this awesome bag will travel! Our Weekender Duffle Pattern includes step-by-step instructions and tons of detailed photographs, walking you through your entire sewing journey! For a complete set of everything you'll need, be sure to also pick up a Weekender Duffle Pattern and Strap Hardware Kit. And for a more information about this Pattern, please click Product Details, above. ¾ yard of midweight fabric. We used Robert Kaufman’s Railroad Denim in Dotted Stripe, Wide Dotted Stripe, and Varied Stripe. 2 yards of bias tape. We used Purl Soho’s Bias Tape By the Yard in Natural or Indigo. 5 yards of 1 1/4-inch webbing. We used Purl Soho’s Sangle Cotton Webbing in Natural. Another option: All of these materials, except the Strap Hardware Kit, come together in our Weekender Duffle Bundle.